Novelist Richard Wright drew from his Mississippi childhood in recalling the visual dominance of trees in the American South. Changes in trees marked the seasons. In spring, “from mossy tree to mossy tree—oak, elm, willow, aspen, sycamore, dogwood, cedar, walnut, ash and hickory—bright green leaves jut from a million branches to form an awning that tries to shield and shade the earth.” Summer he associated with magnolia trees, which filled “the countryside with sweet scent for long miles.” Autumn brought fiery colors: “Red and brown leaves lift and flutter dryly, becoming entangled in the stiff grass and cornstalks.” Winter could seem desolate with the leaves gone, but “the forests resound with the bite of steel axes into tall trees as men gather wood for the leaden days of cold.” Wright captured the everyday importance of trees to Mississippians and other southerners. 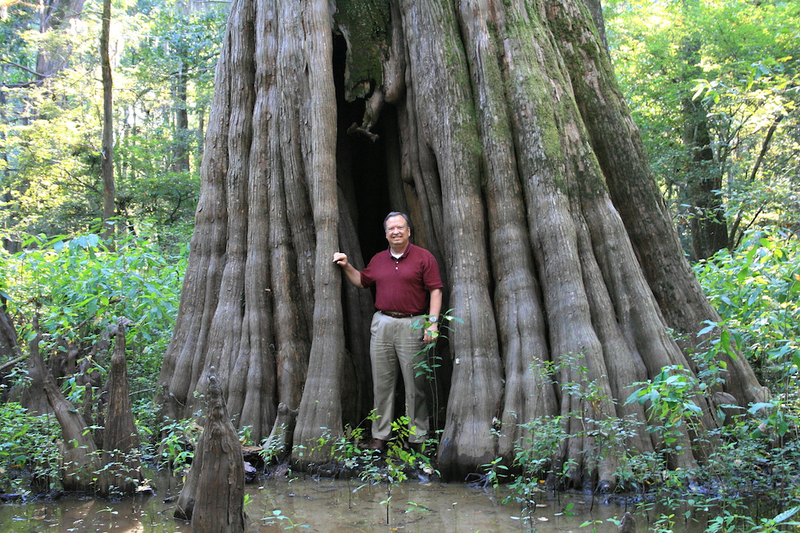 Trees have had environmental, economic, and cultural significance for Mississippi and its people. Trees have provided many resources for Mississippians. The Native Americans made a cedar bark tea to treat whooping cough. Natives and early settlers consumed oak acorns raw or cooked and ground them into a powder for thickening stews. Confederate troops ground and roasted acorns and used them as a coffee substitute. Trees have been essential for wildlife habitat in Mississippi. Quail, wild turkeys, and squirrels eat pine seeds, while cedar cones are a favorite winter food source for birds. Wood ducks, evening grosbeck, and squirrels love cypress seeds. Cottonwood tree sprouts and foliage attract white-tailed deer. Two types of trees grow in Mississippi: conifers and broadleaves. Conifers are evergreens and have needle-like leaves—pines, red cedar, and bald cypress. Wood of most conifers is softer than that of broadleaves, so that in the lumber business conifers are called softwoods. Broadleaf trees such as ashes, maples, hickories, oaks, elms, and gums indeed have broader leaves, and their flowers produce fruit. They are known as hardwoods. Among the most important trees in Mississippi have been pines. Longleaf pine (Pinus palustris), also known as hard pine, heart pine, longstraw pine, and southern yellow pine, produces long needles that hang in three dense clusters at the end of branches and droop downward. Longleaf pines grow 80 to 120 feet high and have diameters between 2 and 2.5 feet. These trees provided most of the material for the timber companies that made the industry one of the state’s largest employers beginning in the early twentieth century. These ancient trees were cut and replaced by faster-growing pines, but longleaf still provides wood for pulpwood in the Pine Belt. The loblolly pine (P. taeda) has become the most frequently planted tree in Mississippi, growing to between 80 and 100 feet tall and routinely measuring 2 feet across, although diameters can occasionally go as high as 4 or 5 feet. Loblollies are planted widely on abandoned or eroded land in North Mississippi to counter extreme runoffs and flooding. Although its wood is not durable, its wood fiber is used in the pulp and paper industry. Pines in general have been at the center of the naval stores industry, providing turpentine, tar, and resin. The eastern red cedar (Juniperus virginiana), also known as the cedar, juniper bush, or savin, is one of the most familiar trees in the state. People see it as a tall tree in old fields, reaching 40 to 50 feet in height, with a trunk diameter between 1 and 2 feet, or as a small shrub along fencerows, with a pyramidal shape and branches near the ground. Historically, it was one of the most frequently used trees in cemeteries. Its wood is moderately heavy, hard, and resistant to shock, making it widely used for cabinets, interior finishes, fence posts, pencils, and furniture. Its oils repel moths, making it appealing as a wood for closets and chests. Folk artists use it for carvings and ornaments. It symbolizes the tree of life for Native American tribes. Mississippi has many oaks, including post oak, white oak, swamp chestnut oak, southern red oak, cherrybark oak, black oak, shumard oak, blackjack oak, water oak, and scarlet oak. The latter grows on dry, sandy upland soils in northern Mississippi, and people plant it as an ornamental because of its red foliage in autumn. The live oak (Quercus virginiana) grows in South Mississippi, mostly along the Gulf Coast and inland as far north as Hinds County. It has long been an icon of the old plantation South, representing a romantic touch because of the tree’s beauty. It grows 50 to 60 feet high with a diameter between 3 and 4 feet. The wood is hard, strong, heavy, tough, and close-grained, contributing to its popularity in the early US shipbuilding industry. In 2005 Hurricane Katrina devastated the live oaks along the coast, though numerous artists have created sculptures out of the wood, preserving the presence of the old trees in new creative forms. Pecan trees (Carya illinoinensis) are tall, and wild ones have heavy, brittle, and coarse-grained wood that is used in the furniture industry. Other pecan species are best known for their fruit, a sweet nut that is produced in orchards, with Mississippi a leading grower. Other fruit trees common in the state include peaches and figs. Many urban and suburban Mississippians know trees as ornamentals, with the flowering dogwood, eastern redbud, and various maples prized for their shapes, flowers, and foliage. Other familiar trees in Mississippi include elms, locusts, white ash, river birch, and osage orange. The southern magnolia (Magnolia grandiflora) is particularly associated with Mississippi. It is the official state tree, its bloom is the state flower, and the state’s nickname is the Magnolia State. The magnolia can grow 90 feet high and 2 to 3 feet in diameter, with lustrous, thick green leaves. Its flowers are showy—cup shaped and white with purple centers—and have a spicy fragrance. A 1977 Time magazine article mentioned “the aphrodisiac-soporific magnolia, more potent by far in midnight bloom than overblown fiction can convey.” The article referred to the mythic southern literary symbol of “moonlight and magnolias” to describe a romanticized South, including Mississippi.